Mary’s Review: It’s Amelia Bedelia’s birthday and she works for Mr. and Mrs. Rogers. To celebrate they give her the day off . She wants to visit her Cousin Alcolu. They give her the keys to their car so she can drive to her cousin’s house. She hasn’t driven in a while so Mr. Rogers go with her so she can warm up on the roads of the countryside. Did you know that two or more words can have the same sound or spelling but differ in meaning? Well, they can. These words are called homonymns. This is were the fun begins!! When Mr. Rogers tells Amelia to “steer” straight ahead, meaning theres’s a cow in front of them she thinks “stear” the car straight ahead and there’s a cow in front of them and she will hit it. He tells her to push the horn on the car to scare the cattle and she pushes the horn on the cow. The car has a flat tire tire and a tow truck comes along and offers them a “tow”. Amelia tells the the driver she all ready has ten “toes”. These are just a few word plays. There are many more. Amelia makes words so much fun while teaching that words cam ne spelled differently, have the same sound and have different meanings. This is a fun and humorous teaching book with wonderful illustrations to make it more fun and colorful. I recommend this book for children ages 4-10. About The Author: Herman Parish was in the fourth grade when his aunt, Peggy Parish, wrote the first book about Amelia Bedelia. The lovable, literal-minded housekeeper has been a member of his family ever since. Peggy Parish died in 1988. She would be proud and delighted to know that with Good Driving, Amelia Bedelia; Bravo, Amelia Bedelia! ; Amelia Bedelia 4 Mayor and now Calling Doctor Amelia Bedelia, her nephew is carrying on — for a new generation of readers — the tradition she began years ago. In His Own Words… “In true Amelia Bedelia fashion, I backed into writing these books about the literal-minded housekeeper who children laugh at and love. Amelia Bedelia was created by my aunt, Peggy Parish. Although she passed away in 1988, Peggy still received fan mail from children. They wondered when the next Amelia Bedelia book would be out. Then other children’s authors wrote and volunteered to continue the series. I felt uneasy about Amelia Bedelia leaving our family. As I was in the fourth grade when she first appeared, I had literally grown up with her. So I decided to try to write a new Amelia Bedelia adventure. My two sisters and my family were very supportive and encouraged me. I’d had experience in writing advertisements. I reread the Amelia Bedelia stories to figure out what made them funny. I realized that everyday life overflows with idiomatic expressions, literalisms, and homophones. It’s amazing more people don’t get confused-besides Amelia Bedelia! 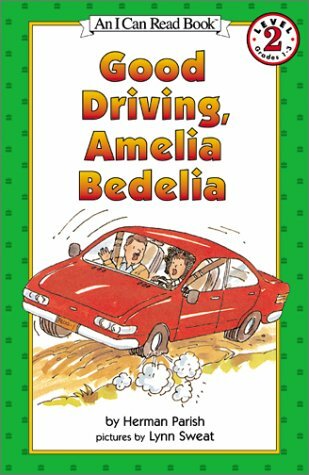 My first book, Good Driving, Amelia Bedelia, took me a year to think about and one night to write. I had been collecting ideas, homonyms, and expressions. Whenever I heard them, I jotted them down: on napkins in restaurants, on my newspaper while riding the bus, and on agenda sheets in business meetings. I stockpiled these fragments in a folder until one Sunday night, with my family asleep, I decided that it was now or never. I sat down around ten o’clock and began to write. I was so focused on the story that I finished as the sun came up on Monday morning. Naturally, the story needed revision, but the essence was captured in that all-night writing spree. I am fortunate that my editor, Susan Hirschman, and the illustrator, Lynn Sweat, had worked with Peggy on many Amelia Bedelia books. That helped make the transition from Peggy’s books to mine as seamless as possible. About The Illustrator: Texas-born artist Lynn Sweat was doing magazine illustration and design work in New York City when he entered the children’s book world, illustrating Birds without Words in 1961. That book won an award from the Society of Illustrators, and caught the eye of Peggy Parish’s publisher, Susan Hirschman. She met with Mr. Sweat and asked him if he’d be interested in doing more children’s book art. After publishing a few books together, Ms. Hirschman thought Mr. Sweat was just the man for the job when Amelia Bedelia needed a new illustrator. His first Amelia Bedelia book was Good Work, Amelia Bedelia—in which, he says, he brought the character back to a more “cartoonish and wacky” look—and he illustrated all of Ms. Parish’s Amelia Bedelia titles until her death in 1988. He describes Ms. Parish as very quirky and funny.